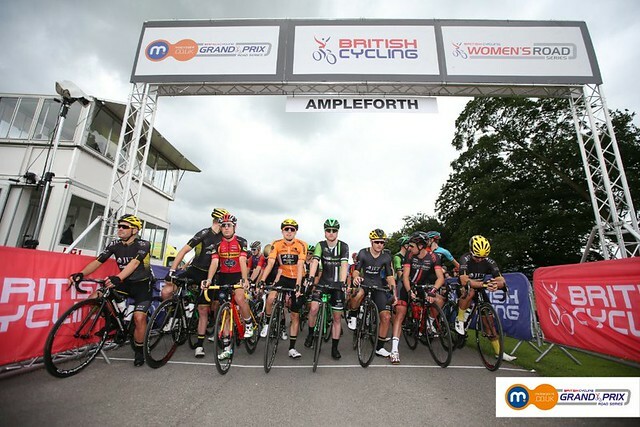 Ian Bibby (NFTO) won the Ryedale Grand Prix for the second year running in the Motorpoint Grand Prix Series, catching Matt Holmes of Madison Genesis right on the line at the end of 93 thrilling miles of racing. Riders were battling it out right from the gun and a group of 20 riders took a small lead. But the peloton remained extremely active and six leaders went clear - Lampier, Martin, Lewis, May, McGowan and Christian. They managed to steal ahead by 1.11. At the end of lap one, Martin was dropped and three chasers kept on the leaders, 20 seconds behind. The gap to the main bunch stood at a minute. The three chasers joined the leaders to make a group of eight with Robbins, Newey and Porter in. Mark Christian (Team Wiggins), David McGowan (Pedal Heaven), Steve Lampier (JLT Condor), Gruffudd Lewis (Madison Genesis), Zachery May (Metaltek Kuota), Elliott Porter (Neon-Velo), Bertie Newey (Catford CC) and Tristan Robbins (Madison Genesis) now made up the leading group as the peloton split on the climb, now in several smaller groups. The gap was 1.20 at the start of the second lap. Newey of Catford, who was doing so well in that leading group, punctured, leaving seven leaders. With 30 miles covered, the peloton fell further behind at 2.17. Boulo and Newey, who were chasing, were caught by the peloton. NFTO worked hard to chase down the leaders but after 40 miles, the gap was still well over a minute. The Heavens opened and a real downpour soaked the leading riders. McGowan of Pedal Heaven was dropped. The riders completed their third lap of the big circuit and moved on to the smaller circuit with six leaders keeping an advantage of 48 seconds. They were Robbins, Lewis, Christian, Porter, Lampier and May. Porter suffered a mechanical problem but made up the lost time. The gap to the bunch dropped to just only 35 seconds. After 66 miles of racing, the leaders were caught with three small laps to go. There were now 18 riders now in the front group before JLT Condor’s Chris Lawless went clear with a 15 second advantage on the chasing group of 17 with 18 miles to go. The rain once again began to fall. Daniel Patten of Team Wiggins tried to chase Lawless down with two laps to go but Lawless held firm and led by 27 seconds. Lawless worked hard to build his gap to 35 seconds, hitting 30mph on the false flats after the hard climbs. He was still out in front with nine miles to go but Steven Lawley of Metaltek and Dexter Gardias of Pedal Heaven chased hard. Lawless’ challenge eventually fell away and as the race reached its conclusion, the bunch suddenly came back together and Matt Holmes was first to try and get away, mounting a solo attack. He did manage to get away but as he reached the line, Ian Bibby darted in front of him to take the win and to add insult to injury, Jack Pullar of Pedal Heaven and Adrian Moreno Sala of Raleigh GAC also managed to steal ahead. “Every year because it’s such a hard grippy course it always wears you down, and there’s always loads of moves going, but in the last two or three kilometres it can change a lot when you enter the grounds,” said Bibby. “A bit like last year, Matt Holmes was away and I was in a group hoping he would come back, and this finish can close up so much the same as Tom Moses last year. “I knew Matt would be struggling. It’s amazing how hard it is up that little kicker, and it’s always extremely fast. “I wasn’t feeling great on the last few laps, but once we got to the finish I would be up there but I wasn’t sure if I would get the win. “We were on the back foot because we missed the break, so the lads rode and rode hard. I owe them quite a lot today, I definitely wouldn’t have done it without them.